The pelahlar is a member of the magnificent dipterocarp family – a group of colossal trees that dominate rainforests across Southeast Asia. Amongst this family of giants the pelahlar has its own unique story to tell. It is found only on Nusakambangan, a small prison island near Java that has become an unlikely haven for some of Indonesia’s rarest wildlife. Nusakambangan’s several high security prisons have limited human settlement on the island, inadvertently helping to retain around 75% of the island’s forest cover. However these prisons have not deterred loggers from travelling to the Nusakambangan to exploit the island’s timber trees. Like other dipterocarps, the pelahlar’s timber is highly sought after. Its large branchless trunk makes it ideal for boat building and these have long been harvested to support this industry on nearby Java. Once believed to be widely distributed across the island, until recently, there were thought to be less than 50 trees remaining in the world. The species also has extremely low rates of natural regeneration, restricting its ability to recover from a drastic population decline. 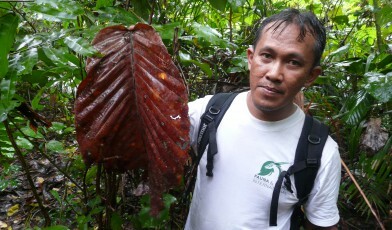 Surveys completed by FFI’s Indonesia Programme and the local Conservation Department (BKDSA) in 2014-15 discovered a number of new pelahlar trees, increasing the known global population size to 149 adult trees. Conservation actions required for the pelahlar include improve monitoring and protection for the remaining trees as well as intensive surveys in the lesser explored northern half of is the island. Knowing the location of every last mature pelahlar will be vital for planning conservation actions for the tree. Propagation of the tree would also provide a safety net for the species and would produce saplings to boost restoration of the degraded forest. However the pelahlar takes many decades to reach full maturity and it will therefore take a long-term commitment to restore the species to its former glory.